This blog sounds like it’s about a boy band. Fear not, it isn’t. Over the last couple of weeks I’ve been building the boards to form the backscenes for my new layout. They aren’t fancy. 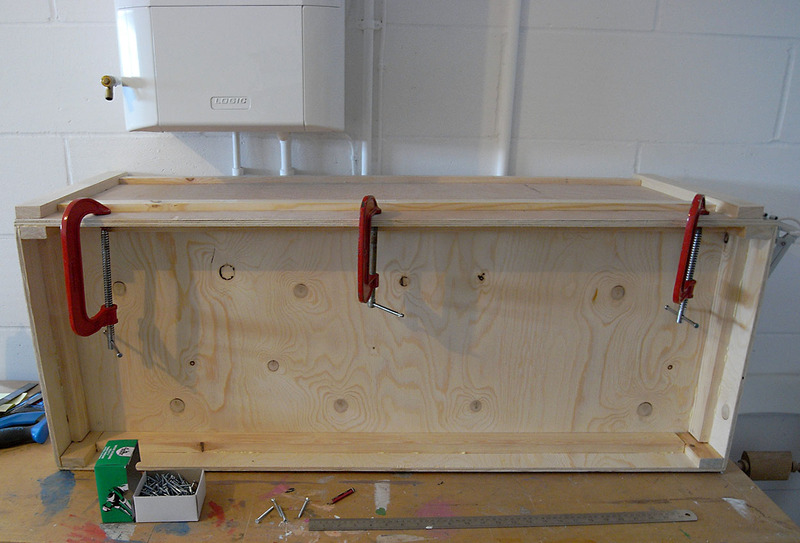 The boards are 3.5mm ply, glued and screwed to a soft wood frame. I gave the layout side of the boards a couple of coats of white undercoat. I may paint them a light sky blue or I may glue a backscene paper to them. I haven’t decided. Either way the undercoat will stop the brown of the ply showing through. The lower part of the backscenes will be masked by the edge of the baseboards so there’s no need to paint them completely. I screwed them to the baseboards. No glue this time. I may want to remove them in the future. Here’s the ‘scenic’ section of the layout. This is the ‘station’ section. I realise most people make the backboards before they lay track and add point motors. I laid the track first because I was keen to see if I could get DCC working. I had to handle this baseboard more carefully when I was fixing the back board. Now, look at this. The two boards joined together! When I finish a job I always stand back and look at what I’ve done. It’s the best bit! Thanks for the complement Sed. And for the reblog. Appreciated both!